The annual Boston Wine Expo will be here in a few weeks, during President’s Day weekend, February 18 & 19, at the Seaport Hotel & World Trade Center. If you plan on attending the Grand Tasting, you'll be confronted with over 1800 wines, an overwhelming amount of wine. As you can only sample a tiny fraction of those wines, which should you choose to taste? Earlier this month, I provided some Advice For Attending The Boston Wine Expo, twenty-five suggestions for making the most of your Expo experience. One of my suggestions was that you take some time and make a plan of which wine regions and/or specific wineries tables you want to visit and taste. Rather than waste your time wandering around the hall, you should have an idea of what you want to taste. I also suggested that you take this opportunity to expand your palate and try different wines, hoping to find new wines to enjoy. With all the diversity of wines available, it makes little sense to spend your time drinking the same wines you drink at home all the time. Be willing to experiment and taste something different. Make the Expo an opportunity to explore the wide world of wine. To assist in your plans, I'm going to provide you with my own suggestions for some wines you should check out. This list will include many of the tables where I will also sample wines as I too like to seek out new wines, to expand my own vinous horizons. On my previous visits to the Expo, I've often found some real treasures. For example, at least year's Expo, I tasted 13 wines which ended up on my Top Ten Wine lists of 2016. There seems to be more diversity at the Expo this year than last, meaning you have the opportunity to taste plenty of more unique and interesting wines. I may add to this list in the days leading up to the Expo, as additional exhibitors and information is added to the Expo website. And if you have any questions, feel free to contact me. As I've often said, Portugal produces some of the best value wines in the world and if you want inexpensive, but delicious, wines then you need to explore Portugal. Portugal has lots of intriguing, indigenous grapes, making their wines unique in a number of ways. Their whites, reds, sparkling wines and Ports are compelling (and check out my post All About Portuguese Wines). Portugal also makes fine, higher end wines as well. Take some time to explore what Portugal has to offer, at the following tables: Burmester (Table 631-Ports), Caves Messias (Table 362), DFJ Wines (Table 360), Dona Maria Wines (Table 635), Esporao (Table 329), L&B Beverage (Table 265), Lemos & Van Zeller (Table 734), LGL Imports (261), Pico Wines (Table 653-Azores), Rui Madeira (633), and Vallegre (Wine & Port, Table 263). The country not the state. Once part of the Soviet Union, Georgia might be the historical birthplace of wine production. It now produces some intriguing and delicious wines, including some made in a very traditional manner in qvevri, earthenware vessels. I've enjoyed a number of Georgian wines (check out my prior post Drink More Georgian Wine) and continue to seek out new ones too. Georgia has brought a large number of producers to the Expo this year and they are well worth checking out. Their tables include Bagrationi 1882 (Table 217), Besini (Table 219), Chateau Mukhrani (Table 224), Corus Imports (Tables 111, 113, 115), Danieli Winery (Table 226), Georgian Wine House (Table 121), Kakhuri Gvinis Marani (Table 129), Kartuli Vazi (Table 127), Qimerioni (Table 211), Shilda (Table 123), Tbilvino (Table 213), Tsereteli Wine & Spirits (Table 215), Vaziani Company (Table 222), and Wine Company Shumi (Table 228). South Africa also seems like it has increased its participation at the Expo this year. There are plenty of excellent wines coming from this country, from killer Chenin Blanc to hearty Syrah, and also the unique Pinotage. The quality of their wines has increased greatly in recent years and new regions in the country are producing plenty of fascinating wines. Check out wines from: Alvi's Drift (Table 220), Anthonij Rupert Wines (Table 227), Beau Joubert (Table 223), Blue Crane Imports (Table 218), Cape Dreams (Table 225), Kysela Perl et Fils (Tables 318/320), Meridian Prime (322, 324, 326), and Robinson & Sinclair (221). 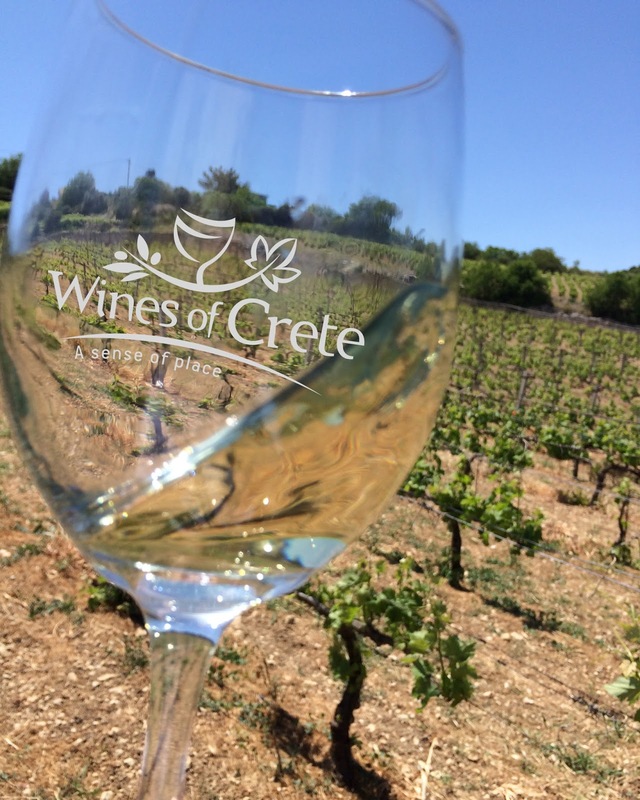 Greece is another country with a lengthy history of wine yet not enough consumers know about their fascinating wines. There are plenty of indigenous grapes in Greece, and they make a full gamut of wines, whites, reds, sparkling, dessert and more. I've found plenty of excellent Greek wine at prior Expos and check out my article, Ten Reasons To Drink Greek Wine. Though there appears to be only two tables of Greek wines at this Expo, that could change, but currently take note of Greek Wine Cellars (Table 720) and Lakonia Greek (Table 201). Diversity of wine is great, and you'll find some wines at the Expo from countries less commonly found in local wine stores and restaurants. This is your opportunity to check out more unique wines from different wine regions. I've had some wines from these regions and found some tasty selections and strongly recommend you give them a chance. I'll definitely be tasting wines at these tables to see what I might find. Check out National Vine & Wine Chamber (Tables 750, 752, 754, & 756). Check out Israel Wine Producers Association (Table 317) and King David Wines (Table 513). Check out Ixsir (Table 354). Check out Ansay International (Table 623). Check out Ville Budureasca (Table 567). There are also some individual producers and tables you should check out, where you will find some delicious wines, of various price points. The French region of Alsace produces some excellent wines, especially white wines and Crémant d'Alsace, but they also produce a small amount of red wines. Check out Fine Terroir Selections (Table 356), which will have at least a Pinot Noir and Riesling. This is one of the best Sherry bodegas in Spain, and I was fortunate to visit the winery back in 2010. I also tasted their wines at last year's Expo and you can read about my favorite wines from that tasting. This year, at Table 511, it seems they will be showcasing their superb Sherries, including La Gitana Manzanilla, Wellington Palo Cortado, Faralon Oloroso, and Triana PX. Hopefully, they will also be sampling some of their fine, non-Sherry wines. You've probably never had wines from New Mexico before, and I don't think I've ever seen wines from that state on local wine store shelves. So I'm excited to check out these wines too, from Southwest Wines (Table 563). Last year, I found some quite enjoyable wines from this New York winery, which will be offering their wines for sample at Table 663. Check out my prior review of their wines. Seek out their Orange wines as well as their Cabernet Franc. A Boston company, 90+ Cellars sources wines from all over the world, offering excellent bargains on a full array of wines. They will have plenty of good wines available for tasting, as always, at the Expo at Table 437. This year, especially keep an eye out for Magic Door La Cle de la Femme Champagne, an excellent bargain and delicious Champagne which is produced with a high percentage of Pinot Meunier. I always stop by this table to see what new wines they have to offer. Not everyone realizes that Vermouth is actually a wine, albeit it is fortified like Port. Vermouth is also much more diverse than many realize, and sampling its variations can be fascinating. Check out Table 264 and maybe you can taste their Bianco, Rosso and Chinato varieties. Vermouth is great in cocktails, but you can also drink it on its own, or with maybe a little tonic or soda water. It also appears that the Wine Expo will be presenting some Spirits for sampling this year, and here are a couple tables you should pay attention. At Table 165, you'll be able to taste some Peruvian Pisco, a type of brandy, which you might have had before in a Pisco Sour cocktail. I enjoy Pisco and recommend you check it out, though you might want to wait to taste it until later in the day because of its higher alcohol content. At Table 161, you'll have the chance to taste Glenrothes Scotch and maybe the famous Luxardo cherries. I've tasted much of the Glenrothes portfolio and found much to enjoy. And you can't go wrong with the cherries too. With everything you'll be drinking, you'll probably want to eat something too, to help soak up some of the alcohol in your belly. There will be numerous food tables at the Expo, from vendors to restaurants, offering free samples. Let me provide a few recommendations for the food as well. They makes a variety of delicious caramels and I've been enjoying their caramels since 2012. They are a local company and have been regularly exhibiting at the Expo. Last year, they were involved in my favorite food & wine pairing of the Expo. I enjoyed their Black Lava Sea Salt Caramel with the Bodegas Hidalgo-La Gitana Alameda Cream Sherry. The sweet and salty caramel went well with the complex flavors of the Sherry, including its nutty, briny and caramel notes. Visit them at Table 345 and sample some of their compelling caramels. Who doesn't love cheese? And cheese and wine go so well together. Stop by Table 820 and sample their various cheeses, and maybe butter and sour cream. Bring your glass of wine and check out how different wines pair with the various cheese. At Table 719, you can taste delicious cheese from Finlandia. Check out they Swiss Cheese, Keisarinna Cheese and butter. At Table 838, you'll find the wonderful Irish cheeses of Kerry Gold. I've never had these cinnamon rolls but they sound intriguing, a diverse mix of flavored cinnamon rolls. So I'll be stopping by Table 239 to check them out. A Boston Cream Pie Cinnamon Roll? Certainly unique. I hope you find my suggestions helpful in making your plans for the Boston Wine Expo. Expand your palate and seek out wines, spirits and foods new to you! The fate of refugees and immigrants are major issues right now, with plenty of heated rhetoric and arguments. President Trump's actions have been condemned by many and the courts have temporarily prevented any action from being taken. Fear is at the heart of much of the discussion and though the threat of terrorism is real, the actual risks from these refugees and immigrants is much much less than the doomsayers proclaim. The basic humanity of these refugees and immigrants needs to factor far greater into these discussions, and compassion needs to be a prominent value. America owes a huge debt to the refugees and immigrants which have previously come to our country. They bring a diversity to our country which only benefits us all. Our country would not be as great as it is without the diversity that such people bring. And the great benefits they bring outweigh the small risk that is entailed. We cannot become insular, shutting our borders to these people. Yes, there may be some bad apples in the bunch but there are bad apples everywhere, including people who have lived in this country their entire lives. We have to understand that these bad apples are a tiny exception and far from the rule. Those bad apples do not reflect the general mentality and behavior of the greater majority of refugees and immigrants. We have vetting procedures to help minimize those risks. Let's consider but one area where America owes a great debts to refugees and immigrants: our culinary scene. There are plenty of others areas that can be discussed but I just want to concentrate on this one area for now. First, many restaurant kitchens, all across the country, couldn't operate without the refugees and immigrants who perform some of the most basic, and still very important, duties, from dish washing to prep work. They work behind the scenes, unseen by the restaurant diners who might only may know the main chef. As they work unseen, too many people fail to understand their vital roles and their importance to what ends up on their plate. In addition, other chefs have adopted the ingredients, recipes and techniques of these refugees and immigrants. Their culinary heritage has spread across the country, becoming firmly ingrained in our society. Without their contributions, our culinary world would be boring and plain.We revel in culinary diversity but need to understand and appreciate the myriad contributions of those refugees and immigrants. 1) Doretta Taverna & Raw Bar knows that Tuesday isn’t the ideal day for a Valentine’s night out, which is why they are letting guests celebrate on their own schedule by offering the special V-day menu from Friday, February 10th until Saturday, February 19th. Doretta will be offering a $65 per person tasting menu with an optional $30 per person wine pairing, a $75 raw tower, and a special bar menu addition of Surf and Turf for 2. This romantic menu features a raw bar, spreads with house-made pita and salad, choose your own mezze, shared entrée, and dessert. 2) Posto, the Italian Restaurant & Wine Bar located in the heart of Davis Square, is offering, on Tuesday, February 14th, a romantic Valentine’s Day menu that will surely impress your honey. Featuring Cotuit Oysters, Lobster Bisque, Black Truffle Mac’N’Cheese, Duck Tortelloni, Fig Risotto, Cauciucco, L’Opera Cake, and Vanilla Panna Cotta. This 3 course prix fixe menu is available for $50 per person or guests can enjoy selected favorites from Posto’s regular menu. Reservations are recommended. --Foie Gras Mousse – grenadine poached quince, almonds, housemade brioche. --Beef Duo – braised short rib, filet mignon, bone marrow crust, pommes aligot, broccoli rabe, Tokyo turnips, natural jus. 4) Besito Mexican, with locations in Chestnut Hill and Burlington, is spicing up Valentine’s Day with a duo of guest-favorite “Platos Principales” specials, including Pescado Relleno, pan-roasted filet of Mahi Mahi stuffed with shrimp, lobster and crabmeat, served over roasted Brussels sprouts and topped with a red bell pepper habanero cream salsa ($32), and Bistec en Salsa Verde, cilantro-marinated pan-seared New York Strip Steak topped with queso asado, guacamole and grilled shrimp ($30). A love-inducing cocktail, the Mi Rosa, a blend of Patron Roca Reposado tequila, guava nectar, simple syrup and fresh lime juice, garnished with a rose petal ($13) is perfect for sipping with your better half, while the Choco Flan, Besito’s famous chocolate cake and caramel flan topped with fresh whipped cream, tequila cream sauce and fresh strawberry sauce, guarantees a sweet ending to the celebratory meal ($8). 5) On Tuesday, February 14, Terramia Ristorante, located in the heart of Boston’s North End, is celebrating Valentine’s Day with a four-course prix fixe menu featuring a romantic take on traditional Italian dishes. Guests can start dinner off with a glass of Villa Sandi Il Fresco Prosecco Brut accompanied by their choice of appetizers including the Insalata di Spinaci with dried California figs, toasted Pignoli nuts and gorgonzola dolce tossed in a pancetta vinaigrette; Caprese, a fresh buffalo mozzarella and tomato salad with basil and olive oil; or the Zuppa Di Funghi, wild mushrooms and chestnut soup with goat cheese and truffle oil. In true Italian fashion there will be a course dedicated to pasta with options such as Pappardelle alla Bolognese, Ravioli di Aragosta, and Risotto Porcini e Asparagi before moving to the main course which includes: Pollo Marsala served with wild mushrooms, smoked pancetta, herb roasted potato and thyme Marsala cream sauce; Filet Mignon with truffle potato mash, sautéed broccoli rabe and a red wine reduction; or Pan Seared Salmon with mustard crab meat crust, roasted potato, wilted baby spinach and a citrus reduction. The night will end on a sweet note when guests choose between the Tiramisu or Torta al Cioccolato Senza Farina, house-baked flourless chocolate cake. The four-course dinner is $75 per person (tax and gratuity not included). Reservations are highly recommended and can be made by calling Terramia at (617) 523-3112. 6) This Valentine’s Day, TAMO Bistro + Bar at the Seaport Hotel will roll out a special menu to attract lovebirds – and lovers of deals – which will feature an array of hors d’oeuvres, followed by a two-course menu and a shared bottle of wine for only $50 per person (plus tax and service). Highlights from Chef Robert Tobin’s Valentine’s Day menu include a local oyster selection with champagne hibiscus granite and exceptional entrees such as duck two ways (confit & roasted with ancient grains, pomegranate, pearl onions) and a lamb shank. For dessert, treat yourself to the chocolate molten cake (cappuccino ice cream and cardamom anglaise) or the ginger flan (dulce de leche, apricots, whipped cream). Top it off by sharing a festive, rum-based Cupid Bowl (Bacardi mango rum, Bacardi coconut rum, mango & cranberry juices, absinthe, strawberries, passion fruit - $40) with your Valentine, which has been added to TAMO’s cocktail list just in time for holiday. 7) Bring your date to Davio's Northern Italian Steakhouse, located in Boston’s Back Bay, for a romantic rendezvous this Valentine’s Day. Davio’s Executive Chef Eric Swartz has prepared a special three-course prix-fixe menu for the evening, which includes items such as the Maine Lobster Risotto, Asparagus, Fresh Herbs, Lobster Cream and 12 oz Prime New York Sirloin, Horseradish Mashed, Green Beans, Bordelaise. The menu will be available Tuesday, February 14th, 2017 for $95 per guest (excluding tax & gratuity). Reservations are recommended and can be made by calling (617) 357-4810. Please note that this will be the only menu available for the evening. 8) This Valentine’s Day, “seas” the love at Saltie Girl, the latest endeavor from restaurateur Kathy Sidell. Throughout the weekend, Friday, February 10th, through Sunday, February 12th, and of course on Tuesday, February 14th, guests will enjoy seven savory specials in addition to Saltie Girl’s regular dinner menu. Guests also have the rare opportunity to make reservations on Tuesday, February 14th, 2017, for one night only. Executive Chef Kyle McClelland has crafted an impressive à la carte menu to compliment the regular dinner options with shareable seafood dishes like Whole Lobster for Two “Chinese Style,” with ginger, scallion and coconut sticky rice, as well as Whole Fried Black Bass for Two with hen of the wood mushrooms, garlic peapods and black garlic sauce. Other featured dishes include Whole Roasted Foie Gras with king trumpet mushrooms and BBQ eel, as well as Hawaiian Kanpachi with grapefruit, kumquat, Serrano chili pepper, trout roe and smoked olive oil. End the evening in true decadence with Oysters and Caviar with Meyer lemon foam, cucumber and caviar. 1) Coda is pleased to announce that a new Date Night menu will soon be available beginning January 23. The two-person, $40 menu will be offered nightly from 5 to 11 p.m. and will include two appetizers, a shareable entrée, and a shareable dessert. Additionally, guests may choose between a selection of three affordably priced wines to add to the meal ranging in price from $25 to $40. 2) BISq, located in Cambridge’s Inman Square, will be revamping its brunch program to feature monthly, themed pop-brunches. Instead of offering a standard brunch every Sunday, BISq will be shifting its focus to offer guests a specially themed, pop-up brunch on the last Sunday of every month. To kick off the program, BISq will be serving up a “Suckling Pig Brunch” on Sunday, January 29. Helmed by Chef de Cuisine Alex Saenz, the menu will be created entirely around whole-roasted suckling pig. In addition to the á la carte menu, the beverage menu will offer mimosas, micheladas, and a variety of other brunch cocktails. Live bluegrass music will also be featured during brunch. Upcoming brunch themes will include “Reggae Brunch" and a "Street Food Brunch,” among others. The pop-up brunches will take place on the last Sunday of each month from 11:00 a.m. to 2:30 p.m.
3) Super Hunger Brunch is an annual initiative hosted by various restaurants around the city and suburbs of Boston to benefit The Greater Boston Food Bank. Each participating restaurant serves a pre-fixe brunch menu with all proceeds donated to The Greater Boston Food Bank. HOW: Go to GBFB.org/brunch to find participating restaurants, and call the restaurant directly to make a reservation. Ask for the Super Hunger Brunch menu when you go to participate. WHY: Every dollar spent on brunch provides three meals to those in need in Eastern Massachusetts. Last year, 2,000 people participated in Super Hunger Brunch helping to provide more than 200,000 meals to families struggling with hunger. The Greater Boston Food Bank (GBFB) is the largest hunger-relief organization in New England and among the largest food banks in the country. GBFB provides nearly 80% of the food distributed by its 550 member agencies throughout the 190 cities and towns in Eastern Massachusetts. GBFB operates four direct service programs at nearly 70 sites throughout the area. A member of Feeding America, the nation’s food bank network, GBFB provides the highest quality of food and healthy meals to more than 140,000 people every month in its mission to create a hunger-free Eastern Massachusetts. 4) Executive Chef Matt Drummond and the team at Loco Taqueria & Oyster Bar invite guests to enjoy an array of new brunch items this winter at Southie’s funky neighborhood taco joint. · Avocado Toast with marble rye toast, aji Amarillo spiced goat cheese, smoked mahi mahi, avocado, sea salt, aleppo and chives. · Fried Chicken & Waffles served atop a housemade jalapeno cornbread waffle and topped with chile maple butter sauce. · PB&J French Toast with two thick cut challah bread slices stuffed with peanut butter and homemade berry jam topped with banana foster sauce and spiced peanuts. Coffee lovers can rejoice with a new caffeine-inspired boozy concoction from Bar Dude Will Falaro called the Brewed Awakening which mixes up vanilla vodka, RumChata, Kahlua and cinnamon-nutmeg cold brew for the perfect “buzz”. 5) February 5, the day of the Super Bowl, is fast approaching and here is an idea to bring your friends and family together for a Super Party: take over the entire space at the ArtBar at Royal Sonesta Boston. Executive Chef Brian Dandro is creating a menu of appetizers, chicken wings, bbq pulled pork, super chocolate fudge brownies with caramel bacon popcorn and more All you have to do is invite 50-75 of your friends, finalize the menu with Chef Brian Dandro, and come cheer on your favorite team! Royal Sonesta Boston is also offering discounted parking in its garage. This is a first-call-first-reserved opportunity, so make the phone call now to Kevin Khem. The ArtBar has also created a special cocktail to commemorate Patriots Quarterback Tom Brady, the Bully For Brady. “We created this with Tom Brady in mind” explains Kevin Khem, restaurants director at Royal Sonesta Boston. “We kept the cocktail clean and fresh with nothing artificial – the way Tom likes to eat. Bully Boy Whiskey is perfect for a football themed cocktail.” You can make this cocktail at home for the Superb Bowl. Directions: Add all ingredients in a shaker and shake. Pour into glassware on the rocks. 6) Margaritas Mexican Restaurant will be offering three specialty catering packages on Superbowl Sunday to fit any size gathering. Guests can choose from the Coin Toss, First Down and Touch Down catering package options, along with their standard Party and Catering Menu and Take Home Kit. All options include their signature Squeeze margarita mix, so you can kick-off the game the right way – with their ‘ritas at home! To place an order, guests simply call their local Margaritas location before 6pm. For well over a century bitters have been a staple at the Italian dinner table, the French aperitif hour, and the American cocktail. What makes these bitters bitter? Why are some so much more drinkable than others? Join Rob Ficks, Bar Manager at Craigie on Main, as he guides a delicious and far-reaching tasting of the world of bitters and their application in fine cocktails. More than nearly any other spirit category, rum has grown explosively over the past decade. Not only does it represent a great value compared to Scotch, Brandy, and American whiskey, Rum also is one of the only spirits that can cater to a wide audience of spirits enthusiasts and cocktail-centric bartenders alike. This seminar will cover the history of rum from its origins in the Caribbean to its spread throughout the world, and include a flight of rums demonstrating the variety of styles and flavors in this fantastically delicious spirit. For Reservations, please call (617) 532-9150. 8) On Tuesday, February 7th at 6:30pm, the team at Branch Line is offering “A Taste of Corsica,” a four course meal with wine pairings. Wine Director Charlie Gaeta specifically paired all wines from Corsica with Chef Stephen Oxaal’s dishes such as Corsican Seafood Soup with lobster, octopus and oregano and House Strozzapretti with marinated squash and chervil. Particularly unique, the wines of Corsica pair well with the grilled meats and deep flavors that the restaurant specializes in; the wines are earth-driven and acidic. Full-bodied whites and light reds balance the flavorful yet not spicy fare. Dinner with pairings cost $125 per person (does not include tax & gratuity). For reservations, please call Branch Line at 617-420-1900. 9) Blackstrap BBQ is hosting an evening for burger connoisseurs, the “Uncle Pats Pop-Up Burger Night and Magic Hat Takeover” on Tuesday, January 31, from 5pm-9pm. Blackstrap BBQ is taking a break from serving up their slow and low smoked BBQ to fire up the grill for an epic night of burgers. Blackstrap chef and owner, Chris Thompson (formerly of East Coast Grill), is inviting longtime friend and burger expert, Pat Spencer (formerly of Cambridge’s All Star Sandwich Bar and East Coast Grill), to give him a hand in creating 5 epic burger options on the planet for one night only. Magic Hat is joining the party and will be taking over the taps, serving three of their favorite brews to accompany a mouthwatering burger – #9, Low Key and Circus Boy. Reservations are suggested but not required. Please call 617-207-1783 for reservations. From Spanish Sherry to California wine, Alex Russan is making his mark in the wine industry. He began with Alexander Jules, acting in some respects as a negociant, visiting Sherry producers and cellar owners and carefully selecting some of their barrels to create a special Sherry. Check my latest Sherry post, Thanksgiving & Amontillado, to find links to my reviews of Alex's Sherries as well as more information on his company. In short, I think he is bottling some of the most delicious and interesting Sherries available in the U.S. Alex has also expanded his operations, importing a select portfolio of Spanish wines. Alex has also been an amateur wine maker for a number of years and finally decided to take it to the next level. He thus established Metrick Wines, naming the company after the maiden name of his maternal grandmother, who is currently 102 years old! His website states: "Metrick is my attempt to make the best possible wines I can, to get to know the grape as deeply as I have the capacity for, and to explore the different wine regions of California." Alex, and his insatiable curiosity, is fascinated with all the questions that arise in wine making. Metrick is partially an attempt to answer these inquiries though Alex also realizes that even if he receives some answers, they will only lead to even further questions. However, like most passionate people, it is the journey that brings the pleasure, despite knowing you will never reach the destination, despite knowing you will never get all your questions answered. It is his objective to produce "Wines made with the goal of staying out of the grapes' way, while encouraging elegance and aromatic complexity." The wines are also produced to be on the lighter style, which are "... as clean and transparent (flavor-wise) as possible, .." The grapes are harvested early as Alex feels that "...what is unique about great grapes from a particular site becomes blurred beyond a certain point of ripeness;..." He is trying to avoid wines which are dominated by ripe fruit and as such he also avoids oak. Currently, Alex produces two wines, a Chardonnay and a Mourvedre, and they just entered the market in December. Alex sent me samples of these two wines, and I recently tasted them, to determine whether they replicate the quality I've found in his Sherries. In short, I was impressed with both wines and eagerly look forward to the future of Metrick Wines. The 2015 Metrick Chardonnay ($36) is made with grapes from the Sierra Madre Vineyard in the Santa Maria AVA. This vineyard, planted in 1971, is considered one of the best cool climate vineyards in California and is also SIP certified, as it is sustainably farmed. The wine was fermented in stainless steel and aged on the lees, in stainless, for about 11 months. It underwent malolactic fermentation, allowing it to be bottled unfiltered, and has a 12% ABV. I found this wine to be crisp and clean, with bright citrus notes and some minerality. There was some richness in the mouthfeel and it came across as elegant and delicious. I paired this wine with some stuffed clams and it was an excellent pairing. It was obvious that this Chardonnay would be perfect with seafood, from sushi to oysters. It would certainly go well with other dishes as well, from fried chicken to pasta carbonara. The 2015 Metrick Mourvèdre ($31) is made with grapes from the Futernick Vineyard in the El Dorado AVA. This vineyard is well known for its Mourvedre grapes, grown in Aiken red volcanic soil at high altitudes. This wine is a blend of 85% Mourvedre, 5% Marsanne, 5% Counoise, and 5% Syrah. The Mouvedre grapes were harvested just after full veraison, "aiming for earthier, more herbal aromatics, rather than a fruit dominated profile." The wine was fermented in 50% stainless steel and 50% concrete. 95% of the juice was free run, and it was then aged for about 11 months in concrete. It was bottled unfixed and unfiltered, and has a 12% ABV. This wine was thoroughly impressive, a light bodied and savory elixir. A complex blend of herbs, olives and earthiness dominated the taste, with subtle hints of berry. It was so ethereal on the palate, with a compelling taste, including a lingering finish, which made me crave a second and third glass. Before we knew it, the bottle was empty and everyone wished there was a second bottle. And with its low alcohol content, having a second bottle wouldn't be a major issue. I would pair this with an herbed, roast chicken or a mushroom risotto, or maybe a venison steak. Highly recommended! Mussels. They are delicious, inexpensive, healthy & sustainable. Unfortunately, despite these compelling reasons, only about 1.1% of Americans purchase mussels. That needs to change and I've written about this matter before. 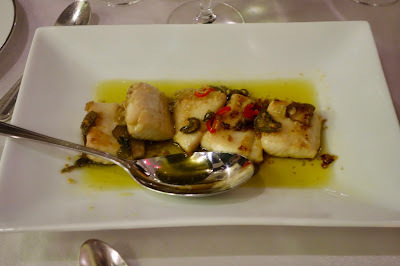 Check out my prior articles: Want Cheap, Tasty, Healthy & Sustainable Seafood? Choose Mussels; Eating More Mussels; and Master Class--Canada’s Organic Blue Mussels. One of the most popular ways to serve mussels is in a broth or sauce, sometimes adding chorizo, tomatoes, or other ingredients to it. The broth/sauce should be tasty in of itself, an alluring liquid which you might even want to devour as you would a soup. With your mussels, you commonly receive some bread, maybe toasted or grilled, which is intended to be dipped into the broth/sauce. That adds a second level to the dish, and if the broth/sauce is especially compelling, it helps to elevate the quality of the dish. However, the dish can fail if the broth/sauce lacks flavor, even if the mussels are cooked perfectly. The same would apply if the broth/sauce is excellent and the mussels failed. Both elements need to be excellent, with a failure in one leading to a failure for the entire dish. There is a caveat though, as even if both elements are excellent, the dish could ultimately fail, or at least be ultimately disappointing. How is that possible? Recently, I checked out a new restaurant, ordering their Mussels, which came with a white wine broth and chorizo, as well as some slices of grilled bread. The mussels were cooked well, tender and tasty, and the chorizo added a nice spicy kick to the dish. The broth was tasty too, and it made you want to sop up the broth with your bread. However, the dish still disappointed me. The problem was that the dish contained only a small amount of broth, not enough for dipping all the bread. Not enough for your spoon if you wanted to eat the broth as a soup. The broth is an important element of such a mussels dish, and a sufficient quantity of that broth should be present. With only a tiny amount of broth in the dish, you also have to move aside lots of the mussels to be able to reach the broth at the bottom. You shouldn't have to work that hard for a tiny amount of broth. Yes, it might seem like a little thing, but it can make or break a dish. It would be easy for the restaurant to remedy and it would make their customers much happier. Give us sufficient broth to enjoy, for dipping our bread and for simply enjoying on its own. 1) Bistro Duet is now open and offers guests a modern French dining experience in one of Arlington's most iconic buildings--the former Arlington Five Cent Savings Bank. Bistro Duet reunites InterContinental Hotel, Boston alumnae Cyrille Couet and Wayne Duprey. "Bistro Duet will celebrate the uniqueness of the iconic bank space while offering contemporary French food and drink in an casually elegant neighborhood environment," says Co-Owner and General Manager Wayne Duprey. Executive Chef and Co-Owner Cyrille Couet is from Frances's Loire Valley, where he began cooking in his uncle’s restaurant at the age of thirteen. Chef Couet's international career has taken him across Europe, the West Indies and the United States. Chef Cyrille was the inaugural chef of Miel Brasserie at the InterContinental, Boston where he worked alongside with Bistro Duet co-owner Wayne Duprey. Chef Couet, most recently, was the executive chef at the Questrom School of Business at Boston University. A native of Dracut, Massachusetts, Bistro Duet co-owner Wayne Duprey will act as general manager. Wayne has managed restaurant and bar operations in the U.S., Europe and Asia. Most recently, he was the assistant director of food and beverage at the Four Seasons Resort, Hualalai in Kailua-Kona, Hawaii. Previously, he was Director of Bars at the InterContinental, Boston. Bistro Duet is a 110-seat restaurant with private dining options. Adjacent to the dining room, the Bistro Duet bar will feature hard-to-find French herbal liqueurs and a selection of locally distilled spirits and regional craft beers. Beverage Operations will be supervised by Wember Castillo, most recently from Oak Long Bar + Kitchen and also formerly of Rumba at the InterContinental, Boston. Messieurs Couet and Duprey have assembled a menu designed to appeal to all palates and pocketbooks. Whether you want to dine casually in the bar lounge side of the restaurant or with more formality in the gorgeous dining room, Bistro Duet will serve you the finest modern French cuisine, seasonally and regionally sourced. 2) On Wednesday, January 25, from 6:30pm-9pm, Civic Kitchen & Drink is hosting its first annual Robert Burns Scotch Dinner to pay tribute to one of Scotland's finest on his birthday, Robert Burns! Widely known as the national poet laureate of Scotland, Burns dinners are held on this day all around the world with whisky, poetry, haggis...and kilts. Civic Kitchen & Drink just opened in 2016. Chef Rick Araujo and GM/Beverage Director Sarah Lee create memorable food and beverage pairings that are worth the drive. This dinner may be the most memorable yet as they celebrate their love for Robert Burns & Scotch. “We are excited to put our own spin on traditional Scottish foods, because, well, haggis! !” shares Araujo. The team at Civic Kitchen & Drink is working closely with Special Guest and Whiskey Expert Charles Tower, of Lost Distilleries and Julio's Liquors. The dinner will feature classic and New World scotches paired with dishes created by Araujo and his team. 3) Posto will be celebrating this Valentine’s Day with a prix fixe, three-course menu for $50 per person. In addition to the prix fixe menu, guests may also choose to order from a selection of favorite items from Posto’s regular menu. 4) Alas, Chocolee Chocolates shuttered its acclaimed retail shop on Dartmouth Street in 2014, but chocolatier Lee Napoli -- whose expertise in all things sweet is legendary in this city -- continues her legacy by sharing her chocolate-making knowledge in a spacious South End classroom on Saturday afternoons at 2:00 p.m.
At the end of the 2 ½ hour class, each student goes home with a 1 lb. box of assorted candies they’ve made themselves. Cost: Chocolate classes are usually $150 per person but from now until the end of March, Ms. Napoli is offering a $50.00 discount, bringing the cost of this unique weekend activity to only $100. 5) Owners Filipo and Phil Frattaroli, Guest Chef Antonella Santacroce, and the rest of the Lucia Ristorante team invite guest to join them for a special, prix fixe “From Abruzzo with Love” dinner, on Monday, February 6, from 6pm-9pm, to benefit the Central Italy Earthquake Relief Fund. 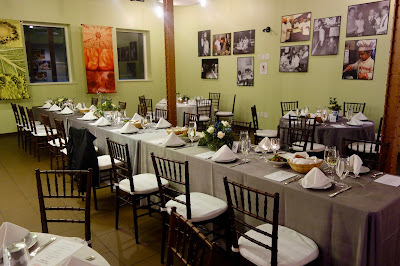 To better accomodate a larger number of guests, this dinner will be held at Filippo Ristorante. The North End's Lucia Ristorante will be celebrating its 40th anniversary this year and to kick off the festivities, it will host this prix fixe dinner with special guest chef Antonella Santacroce. Hailing from Sulmona, Italy in the Abruzzo region, Chef Santacroce will delight guests with a multi-course menu showcasing Abruzzese cuisine. The seated dinner will include menu items such as: polenta Ovidiana with sausage; buccatini all’ Amatriciana with Pecorino cheese and guanciale; and porchetta. Lucia’s house red and white wines will be served alongside the meal. Tickets cost $100, not including tax and gratuity, and can be purchased by calling (617) 742-4142. 6) The Beehive, located in Boston’s South End, will indulge lovers with “Spread The Love”- a 10 day-long celebration featuring Valentine’s Day inspired dishes from Executive Chef Gregory Torrech, drink specials, and live jazz and soul performances. On Tuesday, February 14, guests can enjoy a special prix fixe dinner menu for just $69 per person, but why limit the love to one day? Guests can enjoy the luxe Valentine’s Day menu as a la carte specials that will be served in addition to the regular menu on Friday, February 10 through Sunday, February 19. The Beehive will also be serving a lover’s weekend brunch on Saturday, February 11 and 18 and Sunday February 12 and 19 from 10AM-3PM. All week long guests can get in the mood with romantic live music and one of The Beehive’s Valentine’s Day drink specials. Wine enthusiasts will appreciate The Beehive’s extensive wine list featuring exceptional sparkling and reserve wines. 8) On Thursday, February 9, at 6:30pm, Legal Sea Foods in Park Square will host a wine dinner with selections from Tulip Winery. Established in 2003 by the Itzhaki family, Tulip is the largest boutique winery in Israel that produces approximately 220,000 bottles annually. The Winery, which integrates the production of quality wines with social responsibility, is located on a mountainside in Kfar Tikva (Village of Hope), a small pastoral settlement whose population consists of people with special needs. The Winery aspires to enable members of the community to develop and realize their potential. The noteworthy fusion of the community’s vision and the Itzhaki's desire to produce wine gave rise to an exciting model of a wine industry that employs the community members and offers them a business platform to integrate into the workforce just like in mainstream society. I have tasted several of the wines from the Tulip Winery and were impressed with their quality. In addition, Tulip has a great story and is very socially responsible. This should be a delicious and informative dinner. Happy hour has taken on a whole new meaning at Doretta’s “Opa Hour!” Monday through Friday, from 4 to 6 p.m. and from 9 to close, Doretta is offering $1 oysters at the bar. The oyster offerings will include a variety of three, different oysters that will rotate daily. Past featured oysters have included Hama Hamas, Aunt Dotty’s, Moonshoal’s, Chatham’s, Pemaquid’s, Howland’s Landing, Crowes Pasture, and Johns River. Join Doretta every Sunday through Tuesday night for its new Date Night Menu! For just $50 for two people, guests can enjoy a feast of spreads, choice of several mezze plates, and a Greek dessert platter to end the evening. A special wine list will also be available exclusively just for date night. Doretta has just rolled out its new, winter cocktail list featuring libations such as Adriatico with ouzo, lavender, and cassis, as well as a Greek spin on the classic hot toddy made with brandy, lemon, Tentura, and honey. Whimsical, creative cocktails with name like Grey Eyes, Socratic Method, and Achilles’ Heel will have guests savoring every last drop. Chef Brendan Pelley has established and nurtured his relationships with several foragers and mushroom growers, as well as herbs from his friends at Eva’s Garden to ensure Doretta’s food is only source from the very best purveyors. Among others. Doretta continues to work closely with oyster farmer Jeremey Scheffer from Spearpoint Oysters out of Martha’s Vineyard and Sky 8 Shrimp Farm. Doretta’s unique Chef's Table is the heart and soul of the restaurant’s bustling kitchen. Situated right in the kitchen on the lower floor, the long wooden farm table can accommodate up to 12 guests for a completely private dining experience. Doretta’s chefs will interact with guests to create a special menu while the party’s dedicated server will curate optional wine pairings. The Chef's Table is the perfect place for a whimsical Greek feast! Doretta is excited to have recently unveiled a variety of creative new dishes to the menu! Favorites include Saganaki “Fondue” with Kefalograviera, pickled cranberries, Szechuan peppercorn, and metaxa; Housemade “Hilopites” Pasta with stewed rabbit, cinnamon, chili, and kefalotiri; Vegetable Crudité with pistachio skordalia; and Ouzo-Cured Arctic Char with pickled caper leaf, dill, and pepperoncini. 10) The Light Foundation is “moving the chains” by raffling off a chance for two lucky fans and their guests to sit VIP style for the AFC Championship game at Gillette Stadium on January 22. Former New England Patriots Offensive Lineman and three-time Super Bowl Champion Matt Light is raffling off the second installment of the Playoff Series Raffle, with the “O-Line Edition” playoff package to support his longtime nonprofit, the Light Foundation. A portion of the proceeds will also go to the “Taste of the NFL,” to benefit the Greater Boston Food Bank. Two winners will each bring a guest to sit in a luxury suite at Gillette Stadium for the Patriots vs. Steelers game on January 22nd, following a Dinner at Davio’s Northern Italian Steakhouse at Patriot Place, with Light and a few special guests – former O-linemen Joe Andruzzi, Russ Hochstein and Dan Koppen. Then they’ll head to the stadium where they will sit in the Energi suite to watch the Patriots take on the Steelers in the AFC Championship game. The prize package also comes with an overnight at the Courtyard Marriott in nearby Norwood, a stipend (up to $200 for each group) for transportation to and from the game and a couple of signed helmets from your special O-line dinner guests, and current Patriots players. Raffle tickets are $1 each at www.playoffraffle.org. Raffle proceeds will benefit the Light Foundation, to assist at-risk kids from all over the country in staying on track and becoming leaders in their own communities. A significant number of wine stores carry few, if any Greek wines, and I've been told by some shop owners that Greek wines don't sell. Too many consumers haven't tasted Greek wines and even a significant portion of wine lovers seem to have little experience with Greek wines. For years, I've been promoting Greek wines, as each time I attend a Greek wine tasting, I find more reasons to love their wines. And it's long overdue that Greek wines receive more attention. Let's bring about that change. To help bring more visibility to Greek wines and spirits, I compiled the links to my Greek wine & spirit-related posts into this single article. 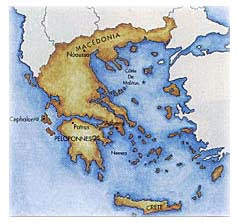 This post will be a repository of those articles and I will update it when I write another article about Greek wines. 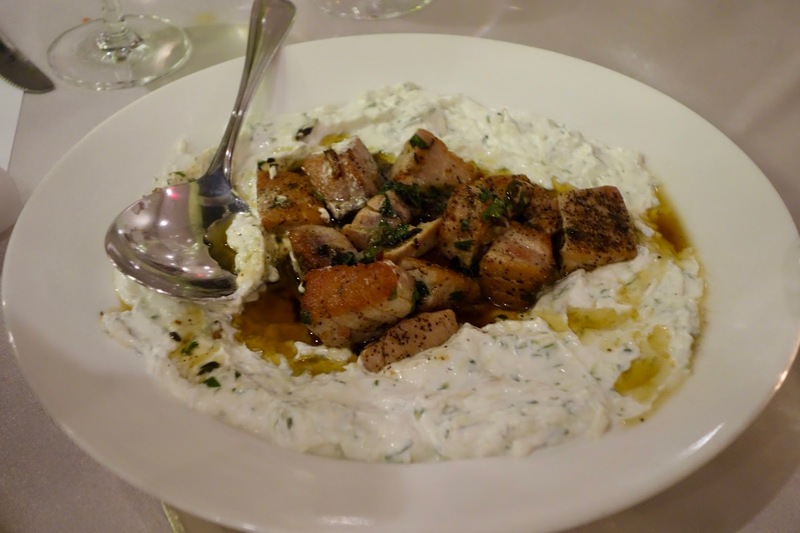 To start, let me provide you some reasons why you should be drinking more Greek wines. I wish more restaurants could be brave, willing to take risks to stay true to a concept or cuisine. However, I understand the market factors which make that difficult for some restaurants, which feel they must cater to their customers, diluting their concept, just so they can stay in business. For example, I know an Italian restaurant, which originally desired to stay true to their concept of Italian regional cuisine, but felt compelled to eventually add a burger to their menu. It was sad to see that addition, yet if they had not made such changes, maybe the restaurant would have had to close by now. And that would have been a tragedy. No matter how great your concept, if you don't have enough customers, you will fail. That is why I want to bring your attention to T'ahpas 529, a new Spanish restaurant on Franklin Street in Melrose. They serve primarily traditional tapas, as well as some non-traditional dishes, and also serve a few larger dishes too, such as paella. I haven't visited it enough to write a more formal review, but I want to highlight one feature which I feel is especially brave. Their wine list concentrates on Spanish wines, with a smattering of wines from other countries including Argentina, Chile, Portugal and Italy. There are 15 wines offered by the glass, from Cava to Rosado (priced $8-$14), but they also have an additional 9 Sherries offered by the glass (priced $9-$14). And offering that many Sherries, especially for a restaurant in Melrose, is brave. Unfortunately, Sherry remains a niche wine, and far too few people have experienced good Sherry. And most Americans that drink Sherry, drink sweet Sherry though dry Sherry is far more popular in Spain. Sherry is delicious and fascinating, with a lengthy and interesting history, and it is one of my favorites types of wine. You can read my more than 30 articles about the various aspects of Sherry, from History to Food Pairing. It certainly pairs very well with Spanish cuisine, though also pairs very well with many other cuisines too. I have often recommended that my readers drink more Sherry and I'm here again to repeat myself. I want to encourage anyone who dines at T'ahpas 529 to be brave and try one of their 9 Sherries. Ask the staff what tapas they suggest you eat with your Sherry. If the restaurant is brave enough to place that many Sherries on their list, you should be brave enough to order one of those Sherries. You might very well be surprised how much you like the Sherry. And if you dislike one of the Sherries, try a different style of Sherry as it could be more fitting to your preferences. 1) On Monday, January 23, at 6:30pm, Legal Sea Foods in Park Square will host a wine dinner with selections from Ravines Wine Cellar. A boutique winery located in an emerging world-class wine region, the Finger Lakes of upstate New York, this small, distinctive winery crafts elegant and food-friendly wines using Old World winemaking traditions with New World innovation. 2) There are some positive changes coming to Jamaica Plain, to a few of the interesting restaurants which are owned by David Doyle, Maricely Perez-Alers, and Keith Harmon. First, Centre Street Cafe has been awarded an upgrade from Wines and Malt Beverages to Wines, Malt Beverages and Liqueurs (commonly referred to as a "Cordials" License). This will allow the restaurant to expand their beverage list to include aperitifs and digestifs -- including Amaro, and simple but iconic cocktails such as the Negroni, the Americano, and Aperol Spritz -- as well as offer a Bloody Mary for brunch. With the numerous artisan liqueurs that are now available, this grants the restaurants lots of flexibility and diversity to create some intriguing and delicious cocktails. Second, Casa Verde has been awarded a non-transferable, All Alcohol License ("Full Liquor" License) pending approval of the ABCC. This will allow the restaurant to serve traditional Margaritas, other classic cocktails, Mezcal, as well as a curated Bourbon list. I'm glad to see some love for Mezcal! And it is always good to see more Bourbon. Third, the group is seeking to open a new restaurant, the Brass Cat Cafe, which would be located at 3399 Washington Street in Jamaica Plain. It will be discussed at a Jamaica Plain Neighborhood Council meeting on Monday, January 23 at 7pm at Curtis Hall, 20 South Street. Pending support from the neighborhood associations related to the Washington Street corridor, and from the Public Service Committee of the JP Neighborhood Council, the Licensing Board for the City of Boston would then decide later in January whether to approve Brass Cat Cafe's application for a Wines, Malt Beverages and Liqueurs License. The ABCC would need to give final approval on the license. At night, the menu would likely revolve around the southeastern quadrant of the United States: American comfort food. Sample items might include fried chicken, jambalaya, ribs, burgers, po' boys, blackened fish, dumplings, etc... Though that is subject to change with time and further discussions. The basic idea though is to keep it simple, affordable and approachable. In addition, they want it to be a great place to work, that adds something to neighborhood, and which the locals will enjoy and support. More information about Brass Cat Cafe will be forthcoming. 3) With the New England Patriots in the Playoffs this Saturday night, heavy favorites against the Houston Texans, many people might be tailgating at home. Brian Dandro, Executive Chef of ArtBar and Royal Sonesta Boston has shared an easy recipe for a tailgating snack. Let's hope Saturday is but another step leading to Brady's Fifth Super Bowl Ring! Mix well and season with salt and pepper. Top with some bread crumbs, sprinkle with more grated parmesan and bake at 350 degrees in a casserole dish until the top is browned and the dip bubbles at the sides. Break out some tortilla chips, pita bread, or some other cracker/bread to scoop up some of this dip. 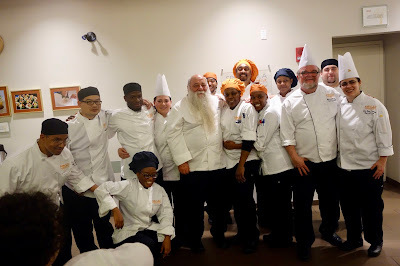 Last month, I praised NECAT: A Culinary School Worthy Of Special Attention, as it is helping to fill the need for trained cooks as well as assisting local people, with challenging backgrounds, to move forward, leave their past behind, and start a new career. It is a great cause, but like most non-profits it can always use more financial support, especially in light of proposed State budget cuts. 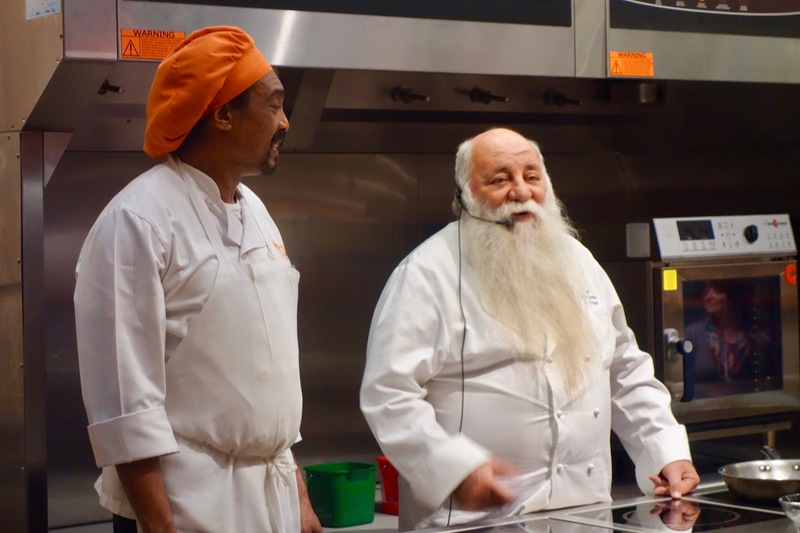 One way NECAT hopes to raise some funds is through their new Master Chef Series, where they invite a famous Chef to work with their students, preparing a special dinner event. 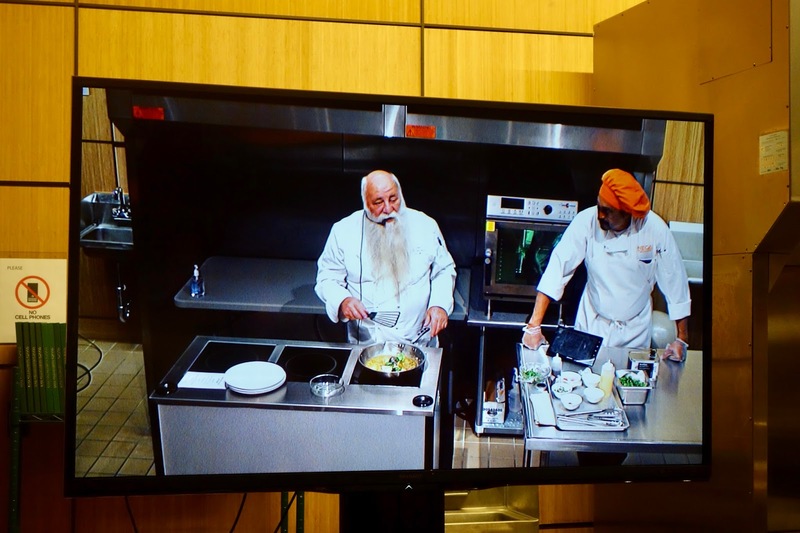 The first Master Chef event was held on December 8, and included passed hors d’oeuvres, a cooking demonstration and a five-course Middle Eastern dinner, centered on seafood. I attended this event as a media guest, and also had a chance to interview their featured chef, the fascinating Uri Jeremias. The resemblance to Santa Claus, including the fact that Uri Jeremias is a very jovial person, is a natural conclusion, especially during December. Chef Jeremias is the owner of Uri Buri, a famous seafood restaurant located in Akko, Israel, and it was established in 1989. Akko, also known as Acre, is located in northern Israel on the Haifa Bay, and has a rich and vibrant history, over 5000 years, and is considered to be one of the oldest cities in the world. Jeremias, who is around 70 years old, was born in the coastal city of Nahariya. As a child, he was drawn to the sea, becoming a fishermen and diver, often cooking the seafood he caught for family and friends. The Mediterranean Sea provided a rich and diverse bounty for his fishing. As Jeremias had ADHD, he didn't attend school too much, preferring to spend his time at the harbor. He loved the quality and quantity of the seafood he found, and self taught himself how to cook. His mother wasn't keen on him cleaning the fish at home so she made him clean it outside. After being tossed out of school when he was 16 years old, he spent a number of years traveling the world. He also served in the Israel Defense Forces, eventually quitting to open a seafood restaurant, urged on by his many friends who loved his cooking. He "... decided he would cook for friends, not customers or clients, but friends." The restaurant is located in a 400-year old Ottoman-era building, serving simple seafood dishes and many Israeli wines. Jeremias has remained self-taught, having never formally studied the culinary arts and never having trained with another chef. For most of his career, he also hasn't relied on written recipes and only began putting his recipes onto paper when he started working on his cookbook. Interestingly, he takes in a number of young people to his restaurant to teach them how to cook seafood but after three years he sends them to culinary school. He feels it is important for them to share a common knowledge with other cooks from other restaurants. In addition, he notes that it has only been in recent years have Israeli cooking schools taught about seafood. His favorite seafood is whatever is freshest in the market. He also believes that there are is no bad seafood, only bad cooks. In addition, he doesn't cook what he won't eat, so there is nothing for show on his playing. Everything is edible and intended to be eaten. Jeremias stated "food has its own aestethic," something many of the best chefs understand. Visually appealing dishes can be very important, though taste is still the most important aspect. Chef Jeremias generally uses no more than 8 ingredients on any plate, trying to keep it simple. However, he also believes that you can spend an entire lifetime working on different combinations of 8 ingredients, and you still will only create a fraction of the myriad possibilities. There is plenty to discover with taste, even with only 8 ingredients. He prefers to prepare small portions for sharing as he feels that after 5-6 bites, a dish is no longer interesting to eat. Importantly, sustainability is crucial to him, as he "believes in preserving nature," noting "we do too much damage already," emptying and polluting the oceans. He won't serve endangered species and doesn't believe others should do so either. He is an ardent proponent of farmed seafood, nothing that it is the future of seafood and certainly cannot be ignored. Jeremias provide some important and simple advice for home cooks on preparing seafood. To him, the main reason for failure in the kitchen are the raw materials used. As such, his two basic rules of cooking are simple: 1) Use the best raw materials; and 2) Don't spoil them. Seafood isn't difficult to cook but many home cooks are afraid of the smell or the bones, and also don't know how to properly buy seafood at the market. Fish just needs to be cooked carefully and for a short time. And to help home cooks even more, Jeremias will soon be bringing his seafood cookbook to the U.S.
His cookbook, Buri: Fish and Seafood, is essentially divided into two parts, the first section concerning how to buy and cook seafood while the second section contains all of the recipes. He believes it is vital for consumers to know how to purchase seafood, a sentiment I have heard from a number of other seafood chefs. It is also important to be able to determine the differences between fresh and frozen seafood, a much greater difference than that encountered with beef and pork. 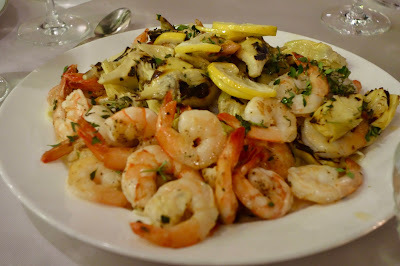 The first section also discusses the basic cooking techniques that can be used to prepare seafood. This entire section is created to allay the fears of home cooks and I think it is a great idea, and much needed. The book also contain numerous photos of seafood, but as they are presented in the market, not in the wild. This will better help consumers buy seafood at their local market. At the Master Chef event, Jeremias conducted a cooking demo, preparing a simple Mackerel dish for the attendees. What an incredible aroma from the cooking fish, lots of garlic and fish sauce. He spent several days working at NECAT and loved it, thinking that it was a special time. He was truly touched by NECAT, noting that it was a "light shining in the darkness." As we chatted, he stated that NECAT, and similar programs, should receive plenty of government assistance as it so important for individuals as well as the community. It is a win/win proposition, and worthy of hearty support. The evening of the Master Chef event began with a reception presenting a variety of passed hors d’oeuvres, with beer and wine. With each bite of these tasty treats, you were drawn into the culinary wonders of Chef Jeremias and the students at NECAT. From an Eggplant Bruschetta, with a smoky and earthy edge, to a bright Ceviche with Sea Bream, it was difficult not to fill up on these small items, though you knew there was a five-course dinner still to come. The other guests also raved about the hors d’oeuvres, and we talked about which were our favorites. After a cooking demonstration, we then sat down for the main meal, presented family style. 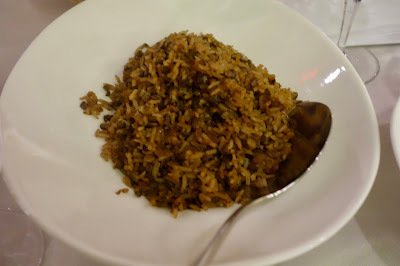 We began with Majadra, a common Middle Eastern fish of lentils, rice and onions. "Majadra" is from an Arabic word that means "pockmarked" as the lentils in the rice allegedly resemble pockmarks. It was a hearty dish, with intriguing spices, enhanced by the earthiness of the lentils. It was easy to understand the popularity of this dish. 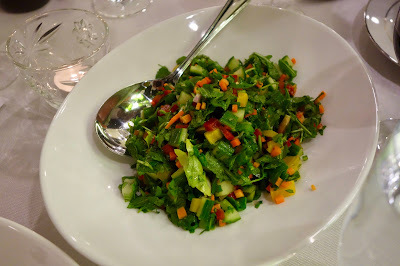 There was also an Arugula Salad, made with golden beets, cucumber, parsley, organic carrot, and pomegranate seeds. A nice combination of fresh ingredients. The Shrimp a la Artichoke was made with citrus, butter, artichoke, and fresh pasta, presenting juicy shrimp in a light and acidic sauce. This showed the simplicity of the seafood dishes of Chef Jeremias, yet it certainly didn't lack in taste. The Tuna a la Plancha, served on top of yogurt, with some picante spices, was another delicious dish. The tuna was moist and meaty, with pleasant spices and a hint of heat, which could be soothed by the creamy yogurt. My favorite dish of the evening was the Mackerel, with fresh coriander, green and red chili peppers, olive oil and garlic. The clean and compelling taste of the fish was at the forefront, enhanced by a mild spicy heat and the delicious taste of garlic. Simple perfection. Chef Uri Jeremias lives up to his vaunted reputation as a master of seafood and it was an honor to have been invited to the Master Chef dinner. I eagerly await the publication of his cookbook in the U.S. and highly recommend everyone else do the same if you have any interest in learning how to cook seafood. I often recommended that people eat more seafood and cook more seafood at home. I've provided advice from other chefs on how to cook seafood at home, and this new seafood cookbook would provide plenty of valuable advice for home cooks. I also want to once again raise awareness of NECAT, a Culinary School Worthy Of Special Attention. Their Master Chef series will continue in 2017 so you should keep an eye out for the next event. It is a great way to support NECAT and I'm sure you'll also enjoy plenty of delicious food and drink.